As tourists and as citizens we have in our hands the power of protecting animals also in a different way: by being conscious of the damage caused by our waste and garbage. After a day at the beach, our garbage left behind can create a dangerous habitat and even end the lives of animals. According to the United Nations there are about 18.000 pieces of plastic floating in every square kilometer of salted water. 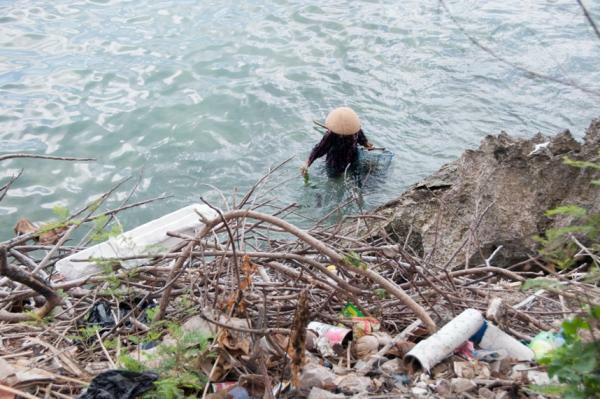 There is an estimate that 80% of the garbage in the water comes from the land and that 20% from the waste is thrown from boats into the water. Between 60% and 80% of the waste – 6.4 millions of tons per year- that end up in our oceans and rivers- are plastic. Even more in areas like east Indonesia where the plastic garbage covers up to 90% of its coast line. The North Pacific has the biggest concentration of floating plastic in the planet. However the highest amount of waste is submerged in the depths of the Mediterranean Sea, the coasts of Spain, France and Italy. After the Mediterranean Sea, the seas that are most contaminated are the Caribbean (600 pieces of plastic per square kilometer), Indonesia (580 pieces) and the Irish Sea (230). *1-2 years: Under the sun rays, a cigarette bud with its filter can take up to two years to disappear. Inside the water, it disintegrates faster but it contaminates more. *100 years: Steel and plastic from a lighter, takes 100 years to transform themselves. Steel exposed to fresh air starts to degrade and rust after 10 years. *100-1000 years: Plastic bottles are the most resistant. Exposed to fresh air they lose their resistance and they break down. But they last longer if buried. *150 years: Plastic bags are a tough challenge for Mother Nature. *1000 years: Disposable polypropylene cups contaminate less than polystyrene, but they take a long time to degrade. *4000 years: All glass bottles, independent of shape and size, are a major problem. Many animals die and suffer as a consequence of these wastes. In some cases, plastic waste goes through the animals’ intestines without seriously hurting them. Other times it is fatal; the pieces of garbage clog their throats or their digestive tracts causing their death by starvation or malnutrition. The garbage accumulated in their stomach can give them the false feeling of satiety. The animal stops eating and slowly dies of hunger. 75% of analyzed loggerhead turtles which die in the Mediterranean Sea showed PVC pieces in their stomachs. They are not the only ones, 60,5% of turtles in the south of Brazil and 56% in Florida (USA) had also swallowed this material. Turtles confuse plastic with jellyfish which is part of their basic diet. Dolphins are the most affected by the plastic waste thrown in the sea. It is increasingly frequent to see them agonizing washed ashore on the beach choking on a plastic bag. The Spanish coast is frequently visited by cetaceans that beach with their stomachs filled with PVC bottles, cans and rests of toys. Another example of the damage that can be caused happened in 2004 on the French coast. That summer a sperm whale was found dead after swallowing a box of plastic. It had clogged its digestive system. In its packing it figured the name of a Spanish supermarket. One third of marine birds swallow plastic in a selective manner, according to its color. Many die drowning. The drama increases when they feed their offspring with plastic pieces. Those that don’t die from suffocation, lose weight gradually and don’t develop well. Plastic is spread throughout the planet, it can be found in the air, the sea and earth. Even big cats in the deep jungle can’t get away from it. Tourists too often throw their garbage in the rivers causing, for example, that plastic bags get caught in the animals’ throats and they stop eating and slowly die. Turtles, seals, penguins and snakes are specially affected by this contamination in the water. Unfortunately, few citizens and tourists are conscious of the damage that they can cause. Spain is the fourth country in the European Community-after Germany, France and Italy- where most plastic bags are used: 10.500 million per year, 238 per person. We barely recycle 10%, an incalculable ecologist cost. Whether it is in our daily routine or when traveling, we have to try to reduce the use of plastic bags and substitute them for biodegradable ones. Likewise, we have to get used to reusing containers, rejecting products that are wrapped in an unnecessary amount of plastic and always clean up all the waste that we find on our beaches and natural environment.